People around the world strongly disapprove of President Donald Trump’s signature policies, according to a spring Pew Research Center survey of 37 countries and findings from the United States. But one policy stands out for its unpopularity: the president’s planned U.S.-Mexico border wall. In 18 of the countries surveyed, the border wall draws the most disapproval of the specific Trump policies tested. The wall generates the most disapproval in Latin America, where roughly three-quarters or more in each of the seven countries polled disagree with the proposal. This includes 94% in Mexico and 90% in Colombia. It is also the president’s least popular policy in Canada (84%). The border wall even draws sharp criticism in parts of the Asia-Pacific region, with the highest disapproval ratings in South Korea (83%), Australia (78%) and Japan (78%). While the idea of a wall between the U.S. and Mexico is widely condemned around the globe, the intensity of reaction to other Trump policies tends to vary by region. Democrats, however, are much more likely than Republicans to disapprove of all policies tested, resulting in partisan differences of 50 to 70 percentage points. And American women are significantly more likely than men to disagree with each of the president’s foreign policy plans. 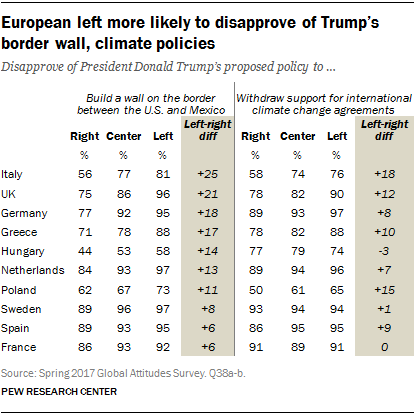 As in the U.S., the two policies that generate the strongest disapproval in Europe are Trump’s plan to remove the U.S. from climate agreements and his proposed border wall. 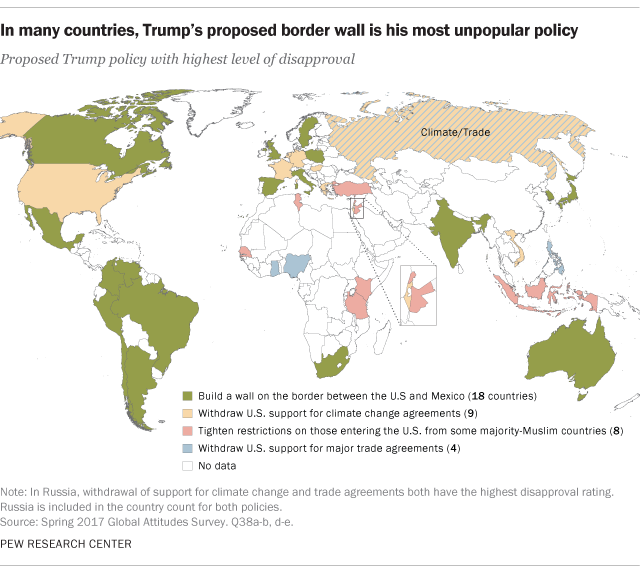 Trump’s climate policy is the most unpopular policy tested in Germany (93%), the Netherlands (91%), France (90%), Greece (82%) and Hungary (75%), while the proposed border wall is the least popular policy in Sweden (94%), Spain (92%), the UK (83%), Italy (72%) and Poland (63%). In most European countries, as in the U.S., those on the left of the ideological spectrum are more likely to disapprove of both policies compared with those on the right. 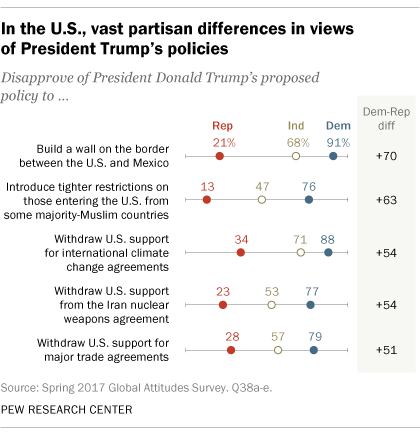 For example, there is a 25-percentage-point gap on views of Trump’s proposed border wall in Italy: 81% of people on the left, but only 56% of those on the right, disapprove. Trump’s plan to tighten restrictions on people entering the U.S. from several majority-Muslim countries is his least popular policy in nearly every country polled in the Middle East and Africa that is home to a substantial Muslim population. Overwhelming majorities in Jordan (96%), Lebanon (88%), Senegal (82%), Turkey (77%), Tunisia (73%) and Tanzania (67%) all object to such a ban. Israel is the only country surveyed in the Middle East where relatively few people disapprove of Trump’s proposal to restrict entry to the U.S. from some Muslim-majority nations (32%). (Instead, Israelis are most strongly opposed to the U.S. withdrawing from climate agreements, with 69% disapproving.) However, Israeli Arabs show much stronger opposition to the travel ban (77%) than Israeli Jews (21%). While Trump’s policies are generally unpopular around the world, some do draw majority support in several countries. For example, in Hungary (70%), Israel (63%), Poland (56%) and Russia (53%), most people support the proposed ban on entry from some majority-Muslim nations. Withdrawing support for the Iran nuclear agreement receives majority support in Jordan (59%) and Israel (67%).